What Omar does is bad enough, and getting worse all the time, but what is even worse still is the fact that the Democrats have embraced her hatred of America. They have embraced and internalized it. It is part of what they are. The horror of the hate that Omar represents and fosters is very real, but we can be grateful that America is seeing this, hearing this, finally — the true face of the new Nazi party, the party of jihad, the party of treason. The notoriously hard-left enemedia has hidden the evil of the Democrat party for far too long. Scrub as they might, this is too evil to shroud. The prisoner she is begging President Trump to help her free is Hoda Abdelmonem, a leader in the terrorist group The Muslim Brotherhood. 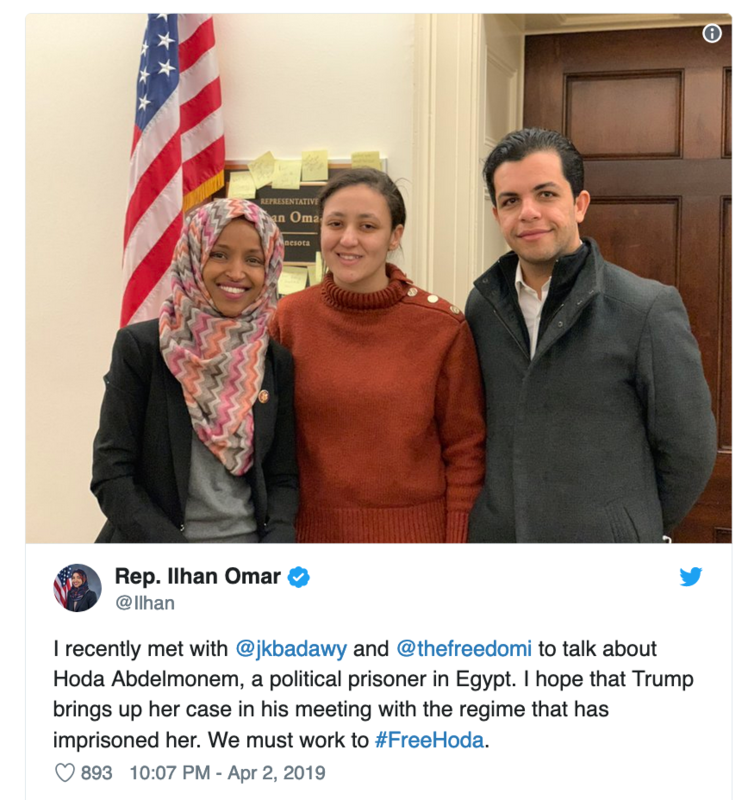 “I recently met with @jkbadawy and @thefreedomi to talk about Hoda Abdelmonem, a political prisoner in Egypt,” she said. “I hope that Trump brings up her case in his meeting with the regime that has imprisoned her. We must work to #FreeHoda,” she said. “I just confirmed: Hoda Abdelmonem is a ***senior female leader**** of the Muslim Brotherhood in Egypt. Why is an American congresswoman advocating for an Islamist activist?” he said.